Good Saturday morning to all~ I have been doing some work with Darkroom Door, this past month, and would like to share some of it with you!! 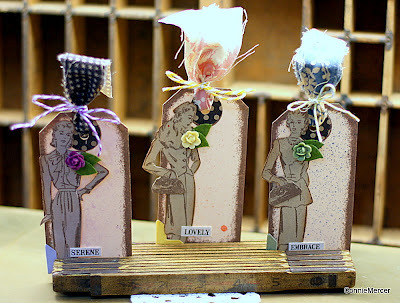 I used two stamp set to make these tags~the tag set and just your style set. Great sets to have in your collection for sure!! On these cards I used the just your style set, the tag set and some Canvas Corp cardstock. Also the Darkroom Door word strips ~ love those!! If you would like to see close-ups of theses sets you can go here Be sure to check out her stamp sets and paper products~they are very unique!! I still have the Celebration thread going on until Wednesday when I will post a winner of the Crafty Goodies box!! If you haven't entered you still have time.!!! Have a great weekend~I'll be over at JBS Scrap Fest doing a weekend crop ~ See ya soon!!! Those are so cool!! I love how you have them displayed in the folding ruler (what are those called??? I can't remember). Seriously talented Connie! I love all the different types of projects you do! ooooo vintage. you are an all around talent. love it!